Yup, once again the aerial link is showing me "Road 2 E" and "Road 6 E". Bobby: Don't know what to tell ya. They work OK for me (and I just tested it on a computer outside my home and it works fine). Weird. Is anyone else having any trouble with this aerial link? Refresh the page and try the new link, Bobby. We'll see if this one works for you. Nope, it still doesn't work. Maybe it's a Firefox thing. Or a Mac thing. This was the local dead mall when I went to Virginia Tech. It was developed by T.D. Steele (who also built Tanglewood and Crossroads Malls in Roanoke) and opened in 1974. The original anchors were Woolco and Heironimus (a regional chain). Woolco gave way to Roses in 1983, and then to a collegiate computer lab called the Math Emporium in 1997. Heironimus was replaced by a branch of the Virginioa Tech University Bookstore, which is the biggest retail tenant left. Most of the smaller stores left when the New River Valley Mall opened in neighboring Chritiansburg in 1988. There is still a massive CVS (former Peoples Drug/Revco)with mall and exterior entrances here. It's the only contiunously operating store left from when it opened. Ther's also a handful of long-time tenants: a gym that's taken over most of the rear side of the mall, a hair salon, a Chinese place with a serious "Enter The Dragon" decorating scheme, an antiquated Ritz Camera, a Kroger across Glade Road that has swallowed the convenience center next door that it originally anchored. 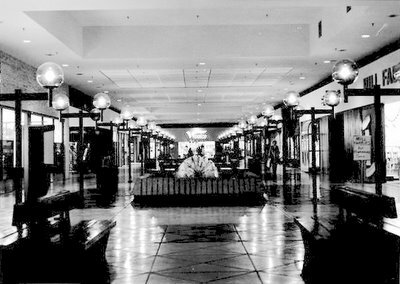 As far as I know, even after a recent interior remodel, the mall still looks a lot like that inside. The pole lighting is still there definately, though the fountain is long gone. It's getting to change a lot though. A local investor bought the place and plans to add a bunch of offices and renovate the exterior. Keith and Bobby, I get the same aerial position as Bobby and I'm using IE7 so it's not a Firefox thing. Or maybe it is? At first I thougt it was the option to save the last position on exit but that's not the problem since after I changed that I was brought right to the location Bobby described out in the middle of nowhere in Washington state. I'm not 100% sure exactly what the problem is but when using IE7 when I signed out of MSN the map refreshed and I was brought to the mall. So I tried it in Firefox, again changing the setting so I wasn't brought back to the last placed visited but again I was brought out to Washington state. This is a good one. LOVE the fountain. I can remember them in the malls of the past, too. In fact, I wonder if they still make them. I want one in my home garden now! Bigmallrat, those are called "dandelion" fountains. There are two standard types, a full sphere and a top-half hemisphere. The full sphere is made to stand on a rider, and though many companies today do the same with the hemispheres, these also look very nice placed at water level so they appear to be a half-submerged ball. You could try Hall Fountains - they used to offer dandelion spheres (Hall calls them "facet fountains") in 4, 6, 8. 10 and 12-foot sizes, both types, with stands. Possible problems: you need thorough two-stage water filtration top prevent the spray nozzles from becoming clogged, and spheres on risers (and, in very windy areas, hemispheres too) need a large pool to contain drift. In a sheltered area a 4' hemisphere would be a great fountain. They also accept colored lighting very well. I was there this weekend. Some empty storefronts, but also some filled ones. A couple of restaurants, some good stores, and a gym keep it alive, along with the Tech bookstore and a tutoring center in anchor spots. There's carpet down now, but those same lampposts are still there! Oh! The fountain is still there, too, but I think it's more prosaic now. Fully functional, though!